Successor to Z800 ‘intermediate naked’ is now Euro4 compliant and probably 10% better all round – more powerful, lighter and better finished and equipped (although it conspicuously shuns electronic rider aids). For Kawa power four fans that’ll probably be enough. For the rest of us, this class is now closer than ever to call. New H2R-inspired tubular steel frame helps shed weight dramatically but compared to rivals like the Street Triple and MT-09 the Kawa is still a solid, hefty machine. Steering is lighter and sharper and suspension, with preload/rebound adjustable forks, is reasonable making it nimble enough for most. But pushed hard this remains one of the larger and heavier of ‘intermediate nakeds’. Euro4 and quest for improvement means old 803cc four is replaced by sleeved-down unit from bigger Z1000. The result is 948cc with a hefty boost in power and torque. It’s a doddle to use, smooth and grunty and, above 6000rpm, thanks to the acoustically tuned airbox, howls like any streetfighter should. Kawasakis have come on in leaps and bounds in recent years in this respect, most conspicuously with their pleasing use of different finishes and textures – the raised Kawasaki tank badge and crocodile skin effect seat finish are two examples here. As regards reliability, it’s too early to call save that the engine, based on that of the Z1000, is in a fairly soft state of tune and lartely proven, so we’ve little to fear. The newcomer is £8249 – £350 up on the old Z800. We’re not saying it’s not worth that and you do get a lot of improved bike for your money, but this class is hotting up to one of the most competitive of all with most rivals, albeit ones with fewer cylinder and a less quality finish and details, significantly less. Although the trend for electronics rider aids has, here, been conspicuously shunned by Kawasaki (the Z900 only comes with the compulsory ABS, possible to help differentiateit from its Z1000 bigger brother and keep it cheaper, too), in most other respects it’s well-equipped with decent clocks, adjustable suspension, span adjustable levers and neat detailing. Engine type Four-stroke, liquid-cooled transverse four. Front suspension Inverted 41mm forks, preload and rebound damping adjustable. Rear suspension Single shock, adjustable spring preload. Front brake 2x300mm petal discs four-piston calipers, ABS . Rear brake 250mm petal disc, single-piston caliper. ABS . 6 owners have reviewed their KAWASAKI Z900 (2017-on) and rated it in a number of areas. Read what they have to say and what they like and dislike about the bike below. Super smooth engine and nice gearbox. Only done 100miles sofar But the Chinese made Dunlop tyres are appalling and spin up too easily even in the dry and sub 5000rpm.I didn't want too risk it so got rid. Can't fault so far but not been on a long run yet but all seems good. Super smooth with predictable power delivery. Should be good as getting over 50mpg on a run keeping too around 70/80. As previously said the tyre's fitted need changing in my opinion (too hard) Fitted Michelin Pilot Powers . Got good deal from Colchester Kawasaki on pre reg 2018 model. Brilliant overall bike. Really good value for money. Z900 will give you all of the smiles you want and will wheely easily. As with all bikes in that class you will need to learn some self-restraint with the throttle hand. I have ridden the main competitors before buying the Z900 and chose it because it was the best overall. MT09 pulls a little better from low revs but one revs rise the Z900 would be a little faster but to be honest the overall experience counts and as much as I loved the MT09's engine everything else about it wasn't as good as Z900. 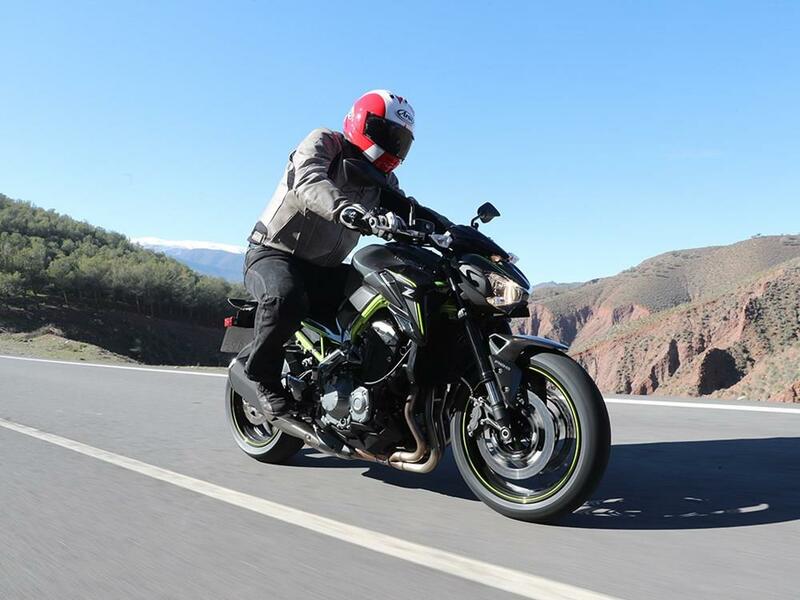 The GSXS750 I tested was surprisingly smooth and didn't feel like it would be left behind the MT09 or Z900 but was let down by its seat which, for me, is really uncomfortable and I don't think one can fix that with aftermarket options. 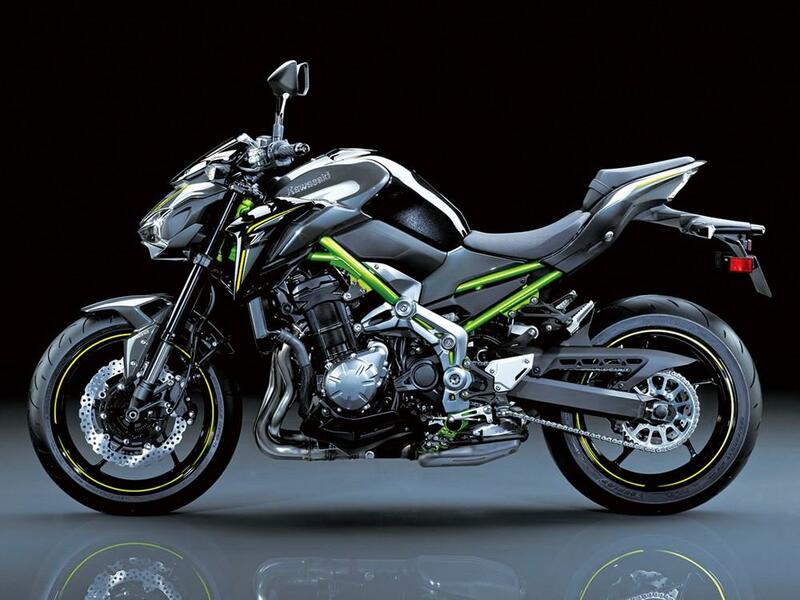 For me the Z900 has the best suspension in the class but that is because I like it on the softer side for comfort. It's soft at first and firms up quickly on braking. It's still preload adjustable so if you want to ride faster you can set it up harder easily. The standard seat is firm and I felt my bottom after about an hour in it so might opt for a softer option. Also because you're seated more in the bike than on top of it there is a little less wind than on other naked bikes such as the MT09. MT09 and GSXS750 have noticeably harder suspension as stock. This is the best bit about the bike. It's very smooth, economical and at the same time more powerful than all of it's rivals. It does produce some vibrations through foot pegs at 4-5k rpm but to be honest most bikes I rode did have some vibrations at some revs. The reliability is spot on so far but I have only done a couple of hundred miles on it so far, so no problems expected anyway. The reliability is why I would not even consider the Street Triple, Japanese bikes are better in this area and having an older bike in my garage which sometimes needs some work I wanted a bike that will simply work and not spend much time being fixed. I am just due for the first service so not sure what will the cost be. In the initial run in period I have averaged 53mpg on the first two tanks and the third tank 55mpg. This is at cruising speeds on A and B roads mostly with occasional blast here and there. 50mpg is easily achievable which means I usually fill up after 160 - 180 miles which is amazing and will be handy when going for longer trips. Still a fairly new bike but there are plenty of accessories to choose from, a wide choice of exhausts, comfier seat, panniers, screens & other bits. As standard bike there is nothing on it as you would expect, so can't say it's got any equipment. One bit I can say is very useful is the under-seat storage, which isn't huge but fits either my disc lock or a mobile phone nicely. The passenger seat is narrow, firm and without any place for a passenger to grab hold off so you are not likely to ride on this bike with your Mrs unless she's been watching 50 Shades of Grey and is up for a rough ride... I would not recommend it for anyone to actually uses the passenger seat. Overall brilliant experience from Kawasaki dealer and got a great deal on it. I approached different dealers for different bikes and Honda would offer 0% deals but weren't prepared to drop the RRP much and would not accept any credit card payments, Suzuki Dealer would haggle but finance options are pricey but would accept credit cards. I negotiated a good deal with the Kawasaki dealer and was still given the 0% interest which closed the deal for me. The Z900 is a great bike overall. I was looking for a bike that will be easy to ride but have tons of power to spare and this bike is it. This engine is just amazing! It has tons of torque and power is available in every gear. The great thing is that its power delivery is very linear and smooth. Nothing like MT09 where you will be surprised/shocked with sudden surge of power. This bike is made to be ridden in all situations. I can commute and it runs very comfortably, then come the weekend I can go on those A road and open the throttle and it roars like a lion. No problems so far, it just works. The bike is giving me around 145miles before the range goes down to "---" Its bit annoying because the range counts down to 35miles and then goes blank! It does not have traction control but this bike is designed so well that you don't ever feel the need for it. It does not have ride modes but I tried MT09 and S1000R and I would never use B modes or A mode because it gets too twitchy so why not have a real bike with real mode! I bought my bike from DAYTONA Motorcycles in Ruislip. Great people and great service. Best of both worlds. Street fighter and tourer. Power to weight ratio is spot on. It really does not need traction control because the bike is designed really well. I tried MT09 and it just wanted the front wheel to go up. Z900 can go faster and I don't have to worry about losing control. Daytona Motorcycles are very friendly people and helpful guys. Excellent so far. Rear tail tidy had to be replaced ,the factory fitted version is ugly. I also swapped the front cover for a larger meter cover,my opinion,.. it looks cooler and those pesky suicide insects stay off your visor . These two items have cost an additional £200, when you spend 8k on a new bike, I guess it is irrelevant. Also added a radiator guard ,I just felt that it needed a bit of protection as it will take the brunt of any projectiles flung at it when you are behind those haulage lorries carrying rubble! I owned a Kawasaki ER6N before purchasing the Z900, four hours riding the ER6N would leave me feeling tired ,.. I could ride the Z900 all day!! The engine is very responsive, treat it with respect or slip that clutch at 70 mph and you will find heaven very quickly!! It's a new bike , I'm running it in to the recommended rpm ratio to gearing , not over heating the engine . This is an area that I need to address , I am fortunate to have a cheaper option. I have mentioned the accessories that I have added to the bike,..like the digital gear indicator,..takes away the embarrassment in town centres ,..no more trying to pull away in fifth gear. Bought from a dealer , paid the RRP, but got an additional two years warranty on top of the two years standard warranty. I love this bike! Z900 for the win! Super Fun and easy to ride. Will turn heads wherever you go. Front brake amazing. Rear brake I feel I have to make extra effort for it to really bite. Very smooth and "torquish". Very short gears so you will find your self kicking the gear pedal 6 times to get to 60mph. Remember I am behaving and not going over 4K rpm. I am a novice and I feel I can handle the throttle and power delivery like I am a pro. The sound is amazing, but it does not scream due to all the regulations this motorcycle has to comply with. I will most definitely add a good Exhaust once the time come. Nothing to point. Everything is as good as the first day. I am doing things right and not going over 5K rpm for the first 1000 miles. Cant wait to discover where the real power is, above 6K rpm. Truth to be said, I have gone to the red line a couple of times red light to red light. Again, very funny. I like pretty much everything, but for long rides, I would go with the optional soft sit. I am pretty skinny and my bottom complains after the first hour. My favorite thing is the engine and the looks. Dealer. I paid 10K for the ABS out of the door (taxes, insurance, etc).